This addon makes the ESO+ craft bag more accessible and customizable. Retrieve Quantity and Stow Quantity raise a quantity dialog, that also allows setting the default. Deposit moves default quantity with each key press, with no dialog. Deposit quantity allows you to specify a quantity to deposit. You must have at least one backpack slot available. Add to Sale lists the default quantity of a material for sale from the craft bag, with no dialog. Add Quantity allows you to specify a quantity to list. Remove from Sale returns the listing to your crafting bag. Add to Mail allows attaching the default quantity of a material to mail from the craft bag, with no dialog. Add Quantity allows attaching specific quantities of materials to mail from the craft bag. Attachment stacks automatically get moved to the backpack for sending. Remove from Mail returns the attachment to your crafting bag. You must have a backpack slot available for each attachment. Add to Offer allows trading the default quantity of a material from the craft bag, with no dialog. Add Quantity allows trading specific quantities of materials from the craft bag. Trade stacks automatically get moved to the backpack for trading. Remove from Offer returns the offered trade materials to your crafting bag. You must have a backpack slot available for each trade stack offered. Sell allows selling the default quantity of a material from the craft bag, with no dialog. Sell Quantity allows selling specific quantities of materials from the craft bag, limited by the max stack size. Stacks to sell automatically get moved to the backpack for before selling. Withdraw withdraws the default quantity with each key press and stows it to the craft bag. Withdraw quantity allows you to specify a quantity to withdraw. Moves the Buy Bank Space keybind to the left side of the withdraw tab, to make room for the new commands. Addon developers: Integrate craft bag functionality into your own addon using the public CraftBagExtended API. Closing a panel that has a Craft Bag Extended craft bag toggle button while a Votan's Search Box filter is active can cause the craft bag toggle button to get stuck. I will work with Votan to resolve this issue in a coming release. I've included Google Translate localizations for the French, Russian and Japanese versions of the settings menu, but I realize they are terrible. If you'd like to submit a better translation, I will be very happy to incorporate it. - Update 21 Wrathstone compatibility. This version is compatible with both live (Murkmire) and PTS. - Moved center keybind strip in guild trader sell tab to the left, to make room for the new keybind on the right. - Support for character-specific and server/world-specific settings. - Update 18 Summerset compatibility. This version is compatible with both live and PTS. - Update LibCustomMenu to v6.5. Thanks Votan! - Adds compatibility with housing storage containers. - Moved "Buy Bank Space" keybind from middle to left side to make room for the new keybinds on the right. - Removed "Disable automatic guild bank craft bag transfer" setting. The same functionality is available in-game under Settings > Gameplay > Auto-Add to Craft Bag. - Performance tuning to eliminate most overhead when not actively transferring items to/from the craft bag. - Switch to LibCustomMenu for keybinds to avoid private method errors as much as possible. - Fix issue with keybinds disappearing for mouseover items after sending mail. - Fix issue with rapid Add to Trade and Attach to Mail commands sometimes throwing errors. - Fix issue with rapid Deposit to Bank commands sometimes failing. - Fix issue with guildBankCallback functions sometimes not getting raised. - Fix issue where TradeRemoveFromOffer() stowedCallback would get called as soon as the stack was removed, if the removedCallback was nil. - Add option to use default quantity for quick stow/retrieve, or use whole stacks. - Fixed bug with Crown Mimic Stones appearing in mail craft bag tab when switching directly from inventory craft bag with keyboard. - Better German translation: thanks, Baertram! - Remove "Retrieve and " + " and Stow" wording from all keybinds to avoid dialog window title overflows in languages other than English and prepare for future gamepad UI support. - "Retrieve and Deposit" is now "Deposit Quantity"
- PTS compatibility for update 11 Shadows of the Hist. Please submit PTS bug reports if you find any. - Fixed bug with inventory craft bag alignment after accessing guild bank craft bag. - Stacks no longer become stuck in backpack if depositing rapidly to guild bank. - Fixed bug with crafting bag items, slot counts, and gold not displaying after closing/reopening the mail send screen. - Deposits an entire stack with each key press. Thanks for the report. This will be fixed in the next release for Elsweyr. This is a bug with the Notebooks addon from what I can tell. The only reason CBE is referenced is the bundled library LibAddonMenu, which Notebooks also uses. CBE has a small conflict with PerfectPixel. 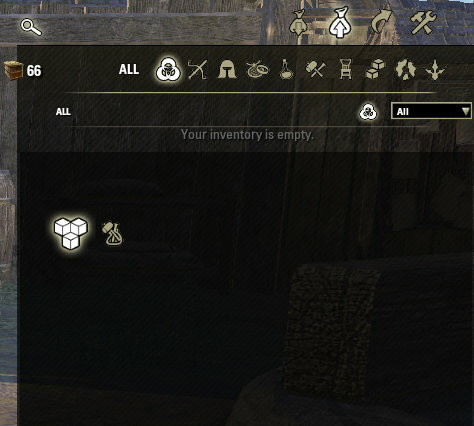 This bug causes the Sell tab at all merchants to be bugged. PP author suggested that you "change the anchor directly to the inventory, and not to the background of the scene". Thanks for the report. This should now be fixed in version 2.5.2. It was LibCustomMenu, but as I mentioned in the edit, that's been updated in the latest version. It is using 6.5, but I'll probably downgrade to 6.4 before Summerset goes live. 6.5 doesn't really cause any issues on live or PTS, but since it doesn't look to ever get out of beta, I'll definitely want to stick with what votan supports going forward. Awsome, thank you! I was just going to LCM's page to ask for clarification on the 6.4 vs 6.5 issue but it looks like somebody already beat me to it. Votan even credited you (sorry, I didn't know you were involved with it). Thanks again for the awesome add ons!! To make it more clear: 6.4 is working on live and did not work in the first week of PTS. This required to make 6.5. But ZOS reverted their changes. So, now 6.4 would work on PTS again. But 6.5 is also working for live and PTS. As @silvereyes released 6.5, it is the current version, but 6.4 is not out-dated. Last edited by RavenMind : 04/26/18 at 06:28 PM. May I ask which lib? Assuming it isn't LibCustomMenu, as I've replaced the LibCustomMenu files in all my installed addons with Votan's v6.4, and this seems to have fixed most, if not all, buggy behavior. I would personally suggest others do the same as some very popular addons are using old versions of that lib, even as far back as v5.0 & previous. Unsure if this is the fault of this mod or Awesome Guild Store, but I'm going to cross post this error. Disabling Craft Bag Extended seems to have solved it but I can't be sure it's not some incompatibility with Awesome Guild Store. It's not really either addon's fault, but rather a shared library that hasn't been updated since last September. However, since it's votan's library, I'll defer to him. [Edit] Got the latest beta version of the shared menu library from votan and upgraded. This should now be fixed in the latest version. Last edited by silvereyes : 04/20/18 at 06:01 AM. EsoUI/Ingame/Inventory/InventorySlot.lua:704: Attempt to access a private function 'PickupInventoryItem' from insecure code. The callstack became untrusted 3 stack frame(s) from the top. ReloadUI sometimes fixes it, sometimes doesn't. I find it weird that nobody else has reported this, it's been happening for a few weeks for me. Last edited by cosmicdan : 04/13/18 at 11:31 PM. Just wanted to say thank you for the fix. It is working again.